Newswise, September 14, 2016 --- Relying on clinical symptoms of memory loss to diagnose Alzheimer’s disease may miss other forms of dementia caused by Alzheimer’s that don’t initially affect memory, reports a new Northwestern Medicine study. “These individuals are often overlooked in clinical trial designs and are missing out on opportunities to participate in clinical trials to treat Alzheimer’s,” said first study author Emily Rogalski, associate professor at Northwestern’s Cognitive Neurology and Alzheimer’s Disease Center. There is more than one kind of Alzheimer's disease. Alzheimer’s can cause language problems, disrupt an individual’s behavior, personality and judgment or even affect someone’s concept of where objects are in space. If it affects personality, it may cause lack of inhibition. “Someone who was very shy may go up to grocery store clerk -- who is a stranger -- and try to give her a hug or kiss,” Rogalski said. This all depends on what part of the brain it attacks. A definitive diagnosis can only be achieved with an autopsy. Emerging evidence suggests an amyloid PET scan, an imaging test that tracks the presence of amyloid -- an abnormal protein whose accumulation in the brain is a hallmark of Alzheimer’s -- may be used during life to determine the likelihood of Alzheimer’s disease pathology. In the study, the authors identify the clinical features of individuals with primary progressive aphasia (PPA), a rare dementia that causes progressive declines in language abilities due to Alzheimer’s disease. Early on in PPA, memory and other thinking abilities are relatively intact. Therefore, biomarkers, such as amyloid PET imaging, are necessary to identify the neuropathological cause, the authors said. Northwestern scientists looked at individuals in mild stages of language loss caused by Alzheimer’s disease and described their brain atrophy based on MRI scans and their results on cognitive tests. The study was published online in the journal Neurology Aug. 26. Dr. Marsel Mesulam, director of the Cognitive Neurology and Alzheimer's Disease Center and the Ruth Dunbar Davee Professor of Neuroscience at Northwestern University Feinberg School of Medicine, is senior author of the paper. The study was funded by grants DC008552 from the National Institute on Deafness and Other Communication Disorders, AG13854 from the National Institute on Aging, NS075075 from the National Institute of Neurological Disorders and Stroke, all of the National Institutes of Health. Newswise, September 14, 2016— If you get pneumonia, or even an infected cut, your body is now a war zone. And as your immune system battles the invading bacteria, the outcome of that war may hinge on a microscopic arms race based not on missiles or bombs, but on an essential element: iron. Now, scientists from the University of Michigan Medical School say they have figured out how that race for iron actually increases the risk we face from one of our most dangerous microscopic foes, Klebsiella pneumoniae. They made the discovery in mice with pneumonia. K. pneumoniae has already figured out how to overcome our best defenses – including, in some cases, all our most powerful antibiotics. It’s the third-most-common cause of infections that arise in hospitalized patients, and causes pneumonia, urinary tract infections, wound infections and bloodstream infections. In its most drug-resistant form, it’s considered one of the carbapenem resistant Enterobacteriaceae, or CRE – so called "nightmare bacteria". 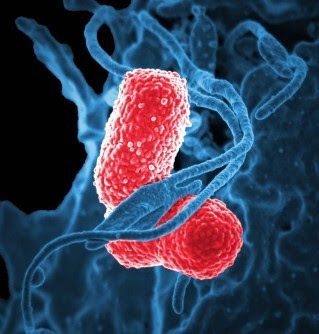 The new findings could aid the search for drugs to fight it, and other “superbugs”. In a new paper in the journal mBio, the team led by Michael Bachman, M.D., Ph.D. report what happens after the bacteria send out tiny iron-scavenging molecules. Called siderophores, those molecules have long been thought of as a way for bacteria to gather a precious element needed to grow and reproduce, by attaching to iron and stealing it from us. Siderophores from K. pneumoniae are hundreds of times more powerful at grabbing iron than the proteins that our own bodies produce. What’s more, the bacteria produce a kind of siderophore that our defense systems can’t neutralize. But Bachman and his colleagues show that bacterial siderophores do much more than just grab iron. Their experiments show that K. pneumoniae actually use the molecules to help them invade the rest of the body beyond their initial point of entry, and to bring on inflammation caused by our own immune system. “This is a bacterium that has evolved new ways to get iron, and it turns out that the mechanism it uses also causes cellular stress during infections,” says Bachman, an assistant professor of pathology at U-M.
That mechanism, a protein called Hif-1alpha, normally helps our bodies respond to low oxygen or low iron. But when K. pneumoniae siderophores activate it, it worsens the infection. Exactly how is still a mystery. Bachman sees the effects of K. pneumoniae on patients in his work as a clinical microbiologist at the U-M Health System, where he’s associate director of clinical microbiology. That motivates him to study it in the lab, though he notes that it’s too early to say exactly how the discovery could be used to help patients. One promising route could be to develop strategies to prevent the bacteria from sending out siderophores in the first place -- or to use the siderophores to bring antibiotics back into bacterial cells. Or, it may even be possible to create a vaccine based on siderophores to teach the immune system to attack them as invaders. Meanwhile, he and others at U-M including Microbiology & Immunology chair Harry Mobley, Ph.D., are pursuing a broader goal through U-M’s Host Microbiome Initiative. Using an advanced genetic technique called transposon sequencing, they’re working to figure out which genes K. pneumoniae and other superbugs absolutely need in order to cause infections. To figure out the double role that siderophores play in a K. pneumoniae infection, Bachman and his colleagues had to figure out how to create bacteria that would not reproduce, while still producing siderophores. They were able to mutate bacteria in a way that kept iron-laden siderophores from getting back into the bacterial cells and promoting growth. That way, the number of bacteria in a mouse’s body stayed the same, but the researchers could study what the siderophores did. They expected that if the siderophores grabbed enough iron from the mouse’s lung tissue and robbed the mouse an essential element, the mouse’s cells would respond. Indeed, they found that the mouse immune system was triggered directly by the siderophores, causing the release of molecules called cytokines that attract infection-fighting cells and cause inflammation as a result. The activation of Hif-1alpha was part of this – because the mouse cells sensed that iron supply was low. So, the team figured out how to eliminate Hif-1alpha in the cells lining the mouse lungs – and showed that in these mice, most of the bacteria couldn’t escape from the lungs to the spleen. But in mice that made Hif-1alpha, more K. pneumoniae bacteria spread to the rest of the body, making the infection worse. “This work provides us with motivation to target the production of siderophores, rather than just the uptake of them,” says Bachman. The research was funded by the Natural Sciences and Engineering Research Council of Canada, through a grant to co-author Martin Dozois. Dozois and co-author Sebastien Houle are at the Institut national de la recherche scientifique, Institut Armand-Frappier, in Laval, Quebec. Recent U-M Ph.D. recipient Victoria Holden is the study’s first author, and the authors also include former research technician Paul Breen. Reference: mBio, 7(6):e01397-16, doi:10.1128/mBio.01397-16. 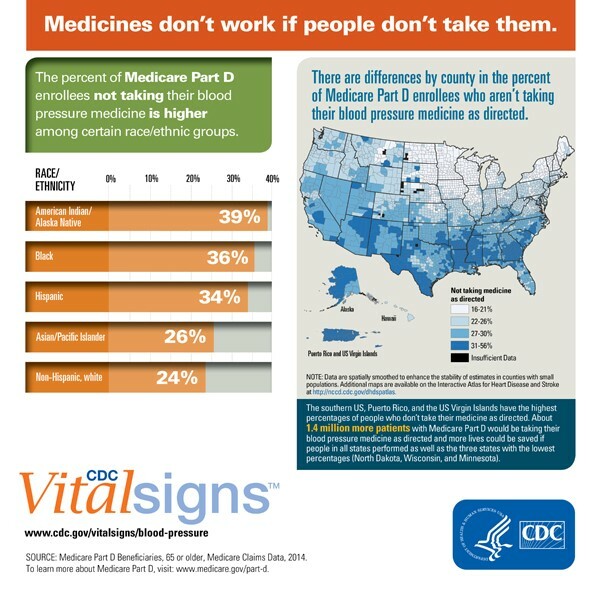 September 14, 2016--Some 5 million Medicare Part D enrollees age 65 and older are not taking their blood pressure medicine properly, increasing their risk of heart disease, stroke, kidney disease, and death, according to a newVital Signs report from the Centers for Disease Control and Prevention (CDC). Medicare Part D is a federal program that helps Medicare beneficiaries with the costs of prescription drugs and prescription drug insurance premiums. Seven out of 10 U.S. adults ages 65 and older have high blood pressure (140/90mmHg or higher), but nearly half do not have their blood pressure under control. The report outlines the dangers of high blood pressure and the important role health care systems play in helping patients take blood pressure medicines as directed. The report analyzes data from more than 18.5 million people enrolled in Medicare Advantage or Original Medicare with Medicare Part D prescription drug coverage during 2014. CDC and the Centers for Medicare & Medicaid Services (CMS) researchers looked at disparities in beneficiary adherence rates based on factors including geography, race/ethnicity, gender, income status, and medication class. 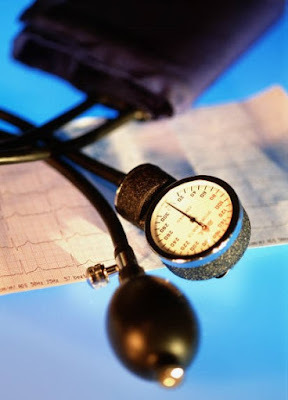 About 5 million Medicare Part D enrollees ages 65 or older are not taking their blood pressure medicine as directed. This means they may skip doses or stop taking it altogether. The percentage of Medicare Part D enrollees not taking their blood pressure medicine is higher among certain racial/ethnic groups (American Indian/Alaska Native, Black, Hispanic). This contributes to these groups’ higher risk of heart attack, stroke, kidney disease, and death. There are also geographic differences. Southern U.S. states, Puerto Rico, and the U.S. Virgin Islands have the highest overall rates of not taking blood-pressure medicines as directed. North Dakota, Wisconsin, and Minnesota have the highest rates of people who do take their medicine as directed. Health care systems—including doctors, nurses, pharmacists, community health workers, practices, hospitals, and insurers—can play a key role in improving blood pressure control nationwide. CDC encourages health care systems to ensure that people understand the importance of blood pressure control and how taking blood pressure medicine as directed along with a healthy diet and exercise lowers risk of heart disease, kidney disease, and stroke. The federal government is also providing resources to all states and Washington, D.C., to prevent chronic disease, including heart disease and stroke; helping states track medication adherence; and encouraging prescription drug plans to improve medicine use through the Medicare Star Ratings program. “While the Medicare prescription drug program has increased the affordability and accessibility of prescription drugs, more can be done to encourage Medicare beneficiaries to take their medications as directed,” said Sean Cavanaugh, CMS deputy administrator and director of the Center for Medicare. To learn more about heart disease and stroke, visit https://www.cdc.gov/heartdisease and https://www.cdc.gov/stroke. For more information on high blood pressure, visit https://www.cdc.gov/bloodpressure. Visit millionhearts.hhs.gov to read about Million Hearts, a national initiative to prevent 1 million heart attacks and strokes by 2017. To learn how professionals and practices have controlled the blood pressure of at least 70 percent of their hypertensive patients, visit http://millionhearts.hhs.gov/partners-progress/champions/index.html. Vital Signs is a report that appears as part of the CDC’s Morbidity and Mortality Weekly Report. Vital Signs provides the latest data and information on key health indicators: cancer prevention, obesity, tobacco use, motor vehicle passenger safety, prescription drug overdose, HIV/AIDS, alcohol use, health care-associated infections, cardiovascular health, teen pregnancy, food safety, and viral hepatitis. September 13, 2016--Baby boomers, adults born between 1945 and 1965, are five times more likely to have been exposed to the hepatitis C virus (HCV). As a result, the Centers for Disease Control and Prevention and the U.S. Preventive Service Task Force recommend that all patients in that age group get tested. 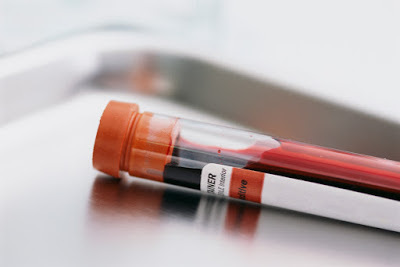 But the simple blood test, designed to detect and prevent illness before the virus wreaks havoc, is infrequently performed on baby boomers whose routine medical appointments are often crammed with other preventive measures and tests -- as well as time spent addressing active problems that require a doctor's immediate attention. Investigators at the University of Michigan Health System recently found an easy way to help primary care physicians ensure that an HCV screening is part of the routine: Electronic medical record alerts. The automated alert, programmed to appear if a patient was within the at-risk age group, reminds doctors not only to issue the test but also provide educational materials about the virus. Implemented in fall 2015 in primary care clinics throughout the U-M health system, the strategy contributed to a significant rise in screenings -- an eightfold boost -- in the first six months alone. "A large part of the success was figuring out how to take the logistical work away, which involves more than looking at a patient's date of birth," says Monica Konerman, M.D., M.Sc., a hepatologist at the University of Michigan who treats patients facing the prospect of hepatitis damaging their liver. It isn't entire clear why hepatitis C rates are higher in baby boomers -- although many, according to the CDC, are believed to have become infected during the 1970s and 80s when rates were highest (and before screenings of donated blood and organs became available in 1992). Hepatitis C, likewise, can be asymptomatic for decades. Many patients could have been exposed to risk factors years ago but never sought testing or treatment. A universal one-time HCV screening based on age, then, can bypass the discomfort of having to talk about potentially embarrassing topics such as prior drug use or sharing needles. It also helps democratize preventive care. Prior to launching the alert, HCV screening was higher in men, Asian and African Americans, and in patients with Medicaid insurance. Screening rates also varied greatly by clinic site (ranging from 20 to 32 percent). After the alert was adopted, however, screenings increased equally among genders, races, insurance plans and UMHS clinic sites. The screening test for hepatitis C is the virus antibody. If the hepatitis C antibody is detected, a confirmation test for the virus' RNA (genetic material) is recommended to confirm chronic infection. Of the 16,773 baby boomers targeted for screening via electronic alert at UMHS, fewer than 1 percent tested positive for the hepatitis C antibody. Despite that low rate, the alert system nonetheless helped identify people who would benefit from curative hepatitis C treatment, says Konerman, who presented the findings in May at the Digestive Disease Week conference in San Diego. After all, a new era in hepatitis treatment began in 2013 with the approval of interferon-free oral combination therapy that was demonstrated in clinical trials studies led by the U-M to cure hepatitis C in 95 percent of patients. If treated and the body responds, patients can get rid of the virus before liver damage and liver failure occur. Which is why the new alert technology is crucial for a population that could benefit most from HCV screening. "The availability of direct-acting antiviral agents has been a game-changer," says Konerman. "Previously, many providers thought screening had low utility: (that) the treatment was terrible and didn't work well. Today, short courses of all oral treatments are highly effective and can prevent progressive liver disease." Newswise, September 13, 2016--AMGA today announced the results and impact of its third annual Measure Up/Pressure Down® National Day of Action: Roll Up Your Sleeves! event. On May 5, during National High Blood Pressure Education Month, a record-setting 144 campaign supporters across the country collectively took nearly 200 "actions" for blood pressure control―including blood pressure screenings, materials dissemination, social media posts, web chats, website content updates, employee trainings, health fairs, and garnering media coverage―reaching 35.4 million Americans. The Measure Up/Pressure Down campaign, administered through AMGA Foundation, the association’s nonprofit arm, encouraged key stakeholders―including medical groups, health systems, sponsors, partners, and other organizations―to "roll up their sleeves" on the same day in support of improving high blood pressure awareness, detection, and control around the country. "We were honored to have our third Measure Up/Pressure Down National Day of Action recognized by U.S. Representative Donald S. Beyer and Senators Tim Kaine and Mark Warner,” said Donald W. Fisher, Ph.D., CAE, president and chief executive officer of AMGA and secretary of the AMGA Foundation Board of Directors. National support and participation enabled Measure Up/Pressure Down to educate millions of patients with or at risk for high blood pressure and empower these patients to actively manage their own health in conjunction with their healthcare team. The National Day of Action also engaged providers to better detect and treat high blood pressure in their patient populations through trainings, guideline implementation, patient engagement programs, and other evidence-based care processes. A full list of National Day of Action supporters, including campaign sponsors and partners, is available at www.MeasureUpPressureDown.com. As part of its efforts, Measure Up/Pressure Down mobilizes medical groups and health systems to achieve the goal of having 80 percent of their patients with high blood pressure under control by 2016. The central mission of the campaign is to encourage medical groups and organized systems of care to adopt one or more evidence-based care processes that lead to measurable improvements in high blood pressure outcomes. Nearly 150 AMGA medical groups and health systems, delivering care to more than 42 million patients, have joined Measure Up/Pressure Down. Since launching in 2012, the campaign has improved hypertension detection and/or control for 542,069 patients.